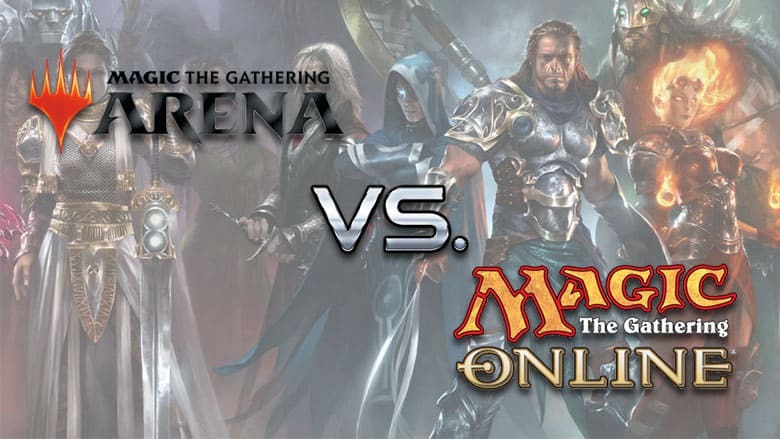 MTG Arena vs. MTGO: The Pros & Cons of Each (2019) | Nerd Much? When you think Magic: The Gathering, you are probably picturing paper playing cards, color-coordinated deck sleeves and playmats, and Friday night at the local card store. 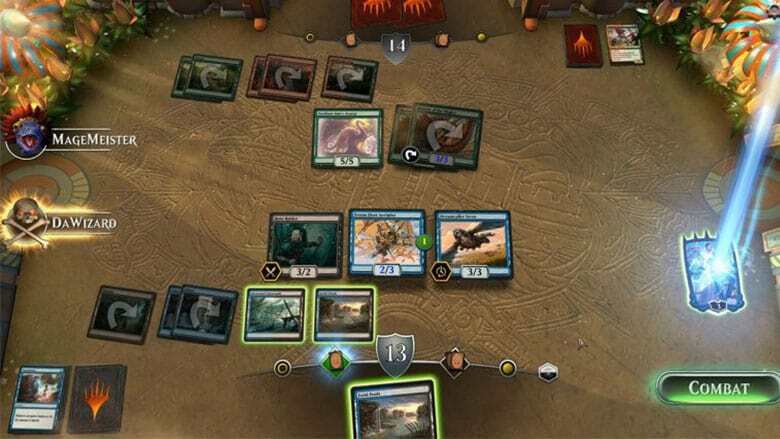 While the in vivo version of the game is still going strong, MTG’s digital players have multiplied in the past few months due to the closed beta version of an all-new online gaming experience called MTG Arena. Wizards announced today that Arena is going live for everyone on September 27, with new perks, like a chance to play the new set, Guilds of Ravnica before anyone else (even pre-release!). MTG Arena boasts a free-to-play game with a gorgeous layout similar to Hearthstone, sound effects, achievements, and more. While some fans are flocking to the new model, others are shrugging it off and sticking to the OG Magic The Gathering Online, which lacks the fancy graphics and the ease of play, but carries a diverse number of formats, more powerful cards, and arguably, more serious players. Should You Play MTG Arena? MTG Arena’s layout and interface are hands down a huge improvement from MTGO. While MTGO gives us only a gray background that your cards are played on, two-dimensional avatars, and a very slow gameplay, MTG Arena has a colorful, fun, themed background for cards that reflects the lore of the current packs. The cards themselves come to life on MTG Arena. Planeswalkers are voiced and say catchphrases when they enter and leave the battlefield, and when their loyalty abilities are activated. When certain creatures enter the battlefield, a three-dimensional portrayal of them appears on-screen and roars at your opponent. The cards physically explode when they are killed or sacrificed, and they bash your opponent’s avatar to the literal face when you attack. The layout is also easier to see and follow than in MTGO, planeswalkers, creatures, lands, and emblems all get their own sections on the screen, and are much easier to read. On top of all of this, even though it’s in its beta phase, MTG Arena glitches much less than MTGO and runs much more smoothly. As a tabletop gamer, I own a very basic laptop, and even with all the new graphics and effects, MTG Arena works much better on my computer. There are also tons of new gameplay differences between MTG Arena and MTGO that make MTG Arena much more accessible to new players. The game begins with a colorful, interactive tutorial that can be easily skipped for OG players, but even during competitive matches, Arena has a way of talking you through it. Whenever you have a card in your hand that you could play (if you have the mana available, and if it can be played at this stage in the game) the card lights up on the screen for only you to see. The same thing happens when you have a creature whose ability could be activated or a card you could tap for mana. Whenever a creature, artifact, or enchantment’s ability could trigger, the card zooms in on the screen and gives you the option to use it or decline. In its default mode, MTG Arena automatically skips phases or turns when players do not have anything available to play, which makes games go much quicker than having to pass priority back and forth during every phase. However, if you want to bluff whether or not you have an instant in hand, you can choose to enter full control mode and pass priority each time like you would in MTGO. You can bluff for as long as you’d like because there are no time limits for games in Arena! On each turn, you have a certain amount of time to act before priority is automatically passed to your opponent. You earn a certain number of timeouts during each game, so if you do not act quickly enough a timeout is used. The number of timeouts is usually more than enough (unless you get up from the computer to walk your dog or something) and players can never lose a game only because they used too much time. This is a great feature for new players, or even for old players who are less familiar with new cards and formats. MTG Arena, in general, is more accessible for newbies, as all of these features make it much, much harder to make mistakes than it would be in MTGO, or even during an in-person match. Additionally, for non-competitive constructed and draft games, you only play one game at a time rather than best two of three. While this makes much less use of your sideboard, of course, it also allows for more flexibility and lets you play different kinds of decks. Perhaps the best feature of MTG Arena is that the entire game is completely FREE to play. The game starts you with a collection of pre-made decks and cards. The decks are pretty low power, but some of the cards you get are pretty intense (for instance, you get four of Chandra Torch of Defiance right off the bat!). You also start with a certain number of wildcards that can be redeemed to earn any card that is available in Arena. There are different wildcards for common, uncommon, rare, and mythic rare cards, and they are earned respectively larger intervals. You earn more wildcards by opening more packs. Sometimes the wildcards will be inside the packs themselves as a card, but for each pack you open, you get closer to earning your next wildcard in each category. This way of building decks not only saves you cash, but it also seems to even out the power level of decks. In MTGO, someone can drop $600+ and build a top tier deck that no one can beat, but in Arena, everyone has an equal chance to build a powerful deck. The only way to put real money into the game is to buy gemstones, which can then pay for more packs and more draft entries. Yes, you could buy a ton of gemstones and get more wildcards quicker, but it’s still harder than just buying all the cards you need. Arena rewards you not for spending money, but for logging play hours. The more games you win, the more packs you earn (or gold you earn to buy more packs), so you get more cards to make your deck stronger, then you win more games…and oops, its 3 AM. You also earn rewards for specific achievements, such as playing a certain number of creatures of one color or dealing 50 damage to an opponent. Players get rewarded with gold and packs for playing more games, which lets them, in turn, create stronger decks with better cards. While MTG Arena may be more user-friendly and super fun to play, it really lacks any diversity in game formats. Currently, MTG Arena plays standard and draft (using packs in current standard). 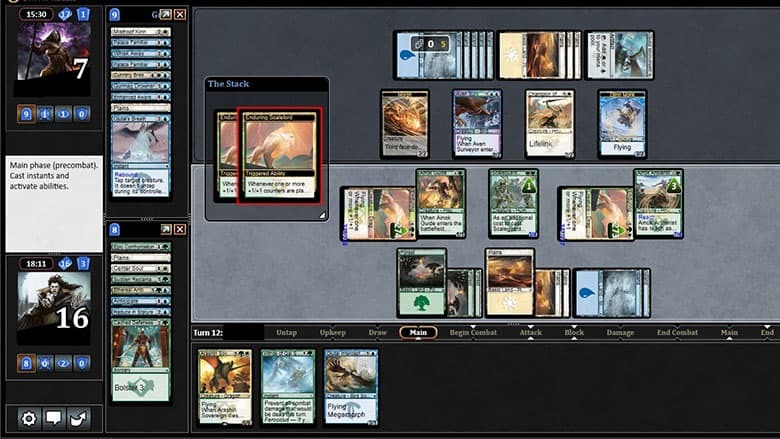 It occasionally tries out new formats such as Exploration (play 2 lands a turn, no maximum hand size) and Momir’s Madness (play 60 land cards, use Momir’s ability each turn, tap any number of lands and discard a card and cast a random token copy of any creature in current standard), but if you’re into Modern, Commander, Legacy, Pauper, Vintage, or anything else, you’re out of luck. MTGO still runs all of these formats, and a few times a year hosts a cube, which is arguably one of the most fun formats to play. With Standard rotating in a few weeks, it’s unclear what will happen to the cards and decks that players have earned in MTG Arena. There is a very good chance we will be starting over. With MTGO there is always an option to play your old standard cards in other formats or to trade them in for new cards. MTGO also has a lot more chances to build up your own deck to make it top tier, if you’re willing to pay to play. If you like playing extremely powerful decks, the formats on MTGO, as well as the ability to purchase the cards you need are definitely more your speed. There are a limited number of cards in MTG Arena, and its hard to collect a lot of mythic rare cards even if you’re putting in money, so deck building is much quicker and easier in MTGO. If you’ve already put money into MTGO, it definitely makes sense to stick around. Digital copies of cards have a surprising amount of value, and you can build a much stronger deck or maybe even earn your money back on MTGO, while in Arena you’d basically be starting over. For these reasons specifically, you are probably still going to find more competitive, serious players on MTGO rather than MTG Arena. If you are a pro or a streamer looking for a high level, competitive game or tournament, your best bet would be looking on MTGO. Additionally, if you’re looking to play against specific people or friends, MTGO is the way to go. Wizards has mentioned adding friends lists to Arena soon, but as of now, all opponents are randomized. With everyone having the same 8 choices for planeswalker avatars and a short name, it’s almost impossible to even know who you are playing against. MTGO has better options and profiles. More flexibility in building your decks, and in building higher power level decks. More available formats, such as modern, commander, legacy, vintage, pauper, momir, etc. You’ve gotta pay to play, and online cards can be expensive, particularly if you want to build top tier decks. Ultimately, if you are a new or casual player, you enjoy playing tabletop and video games, or you just generally love the game of Magic, you should check out Arena. If you’re an OG or a pro, into more competitive play, powerful formats, and expensive cards, then you’re probably better off staying on MTGO for now. We are excited to see what could be next from MTG Arena!